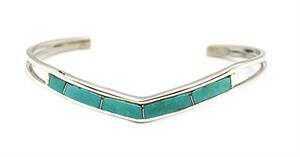 Sterling silver, stabalized turquoise inlay "v" shank bracelet. Border and shank is made with square wire. It measures appoximately 1/4" wide and length of inlay is about 2" long on top. It is Navajo hand made by Jamie Johnson. Number of cuts may vary. Color shade of turquoise may vary as well.